Update: I have now placed the zip containing the source for the end result of part 1 and 2 of this service template here. Two weeks ago I began the series with a discussion on how to make a new C# Windows Service template that is “debuggable” (you can find the article here). 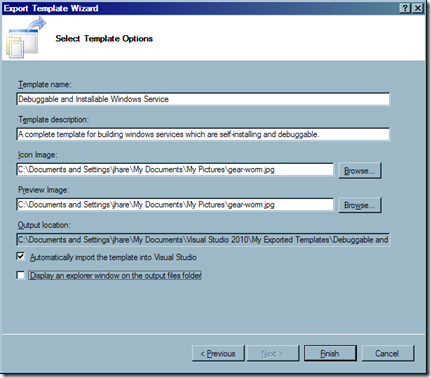 I had then intended the next week to follow up with a discussion on how to modify that template to make the service “self-installing”. Unfortunately, with my work schedule I wasn’t able to complete the series last week due to a product deployment schedule that involved a lot of nights, so I did a brief piece on features I would like to see in C# 5.0 and beyond instead (here). But now my evenings have quieted down again and I’m ready to discuss part two of my C# Windows Services template which will cover how to make your service “self-installing”. 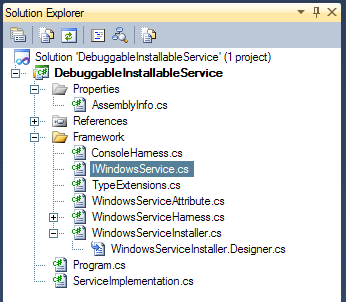 Taking the debuggable service template we built from the last discussion, we will now build on it and add the ability to let the service install itself. 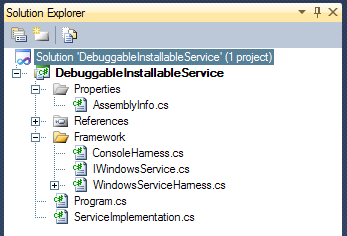 The second problem with the existing C# Windows Service template (the first being that its hard to debug) is that the code generated can’t be run under the debugger, and you have to write your own installer for it. Unfortunately, this is a manual process that must be done each time, unless, of course, we write a helper class and incorporate it into our template. You’ll notice we have a lot of helper code going into our template now. Unfortunately, with generating templates there is not an easy way to extract references that aren’t part of the .NET Framework (or aren’t in the GAC). So for now we will have our helper classes in a solution folder called Framework, although we could easily extract it into its own class library, sign it, and put it in the GAC instead if we chose to make our template more clean. Now that we’ve isolated a lot of our extra helper code into its own folder which (when closed) makes our solution look much cleaner. This is the same code we’d pull into a class library (perhaps called WindowsServiceFramework) later if we so choose. Now that we’ve cleaned up a bit, let’s think about how we can tell this service how to install itself. Basically we need to be able to provide the details on what the service is called and how it behaves. We could just call a method call, but that feels clunky. On things like this where you are specifying static configuration information (such as installer data), I prefer to use attributes. I’d like to be able to decorate my ServiceImplementation class with an attribute that will tell it how to install itself. In my mind this makes the most sense and is the most obvious. 4:     // The name of the service. 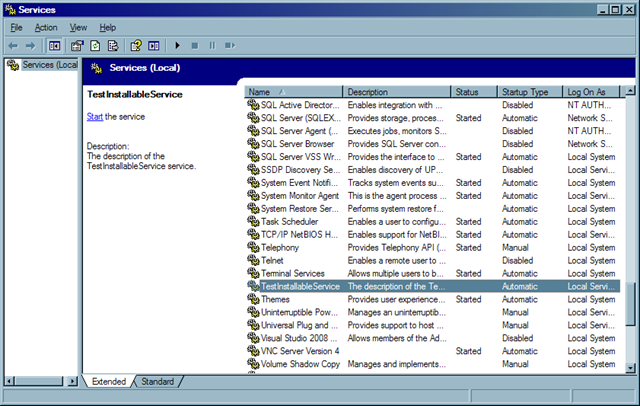 7:     // The displayable name that shows in service manager (defaults to Name). 10:     // A textural description of the service name (defaults to Name). 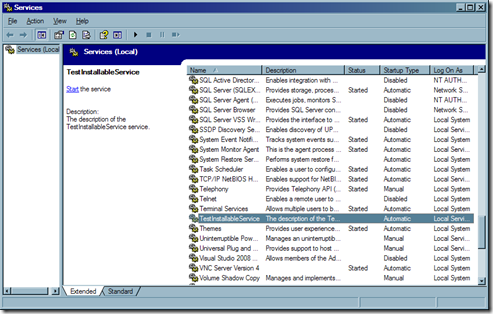 14:     // UserName field causes the service to run as ServiceAccount.LocalService. 18:     // if the UserName is empty or null, this property is ignored. 23:     // start and stop events. 26:     // The method to start the service when the machine reboots (defaults to Manual). 29:     // True if service supports pause and continue (defaults to true). 32:     // True if service supports shutdown event (defaults to true). 35:     // True if service supports stop event (defaults to true). 38:     // Marks an IWindowsService with configuration and installation attributes. 41:         // set name and default description and display name to name. 46:         // default all other attributes. 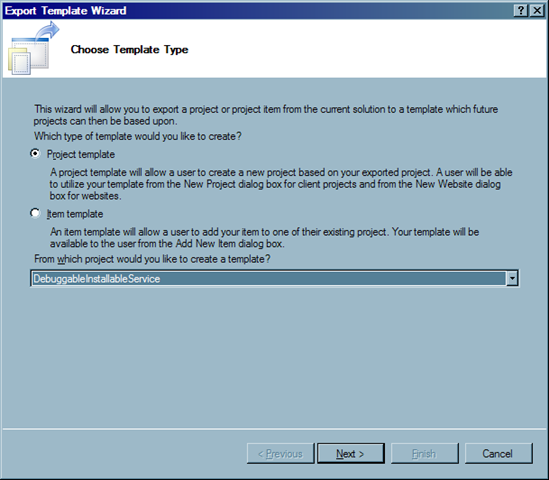 Now that we have that attribute defined, we can give our ServiceImplementation class a boiler-plate version of this attribute that the user will fill in later after creating the template. 2: // that get filled in when the code is generated. Okay, so now we have an attribute! Unfortunately, attributes are not magic. You have to query them and then use them. I have a helper extension method I like to use that makes it easier to query class attributes (I have another one for assembly attributes as well), so we’ll drop that in our Framework too but feel free to use it elsewhere. 4:     // Queries a type for a list of all attributes of a specific type. 22:     // Queries a type for the first attribute of a specific type. Now that we have that, we can query the attribute easily off of our IWindowsService implementation. But once we have that data what do we do with it? First, we need to use this attribute to actually change our service behavior. Once we've done that, we have to write an actual installer class that uses the values to install or uninstall the windows service. The first thing we need to do in writing an installer is to add a reference to System.Configuration.Install. 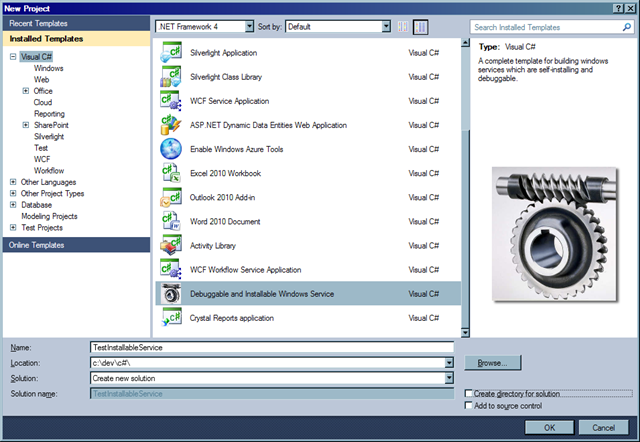 This gives us access to the Install class which we will subclass to make our windows service installer. Once we add this reference, right-click on the Framework folder and add a Installer Class item. This will give you an Install class component which we can then fill in with the details of how to install our service. 5:     // Gets or sets the type of the windows service to install. 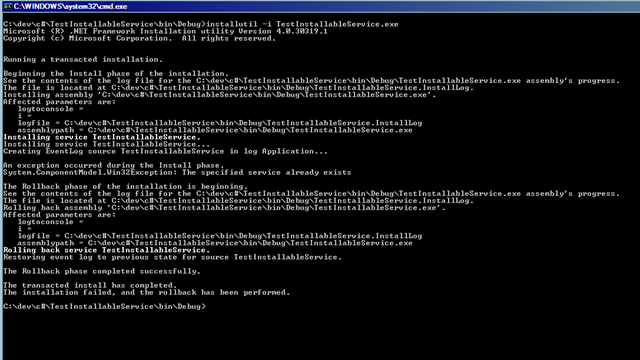 13:     // Creates a windows service installer using the type specified. 33:     // Performs a transacted installation at run-time of the AutoCounterInstaller and any other listed installers. 47:     // Performs a transacted un-installation at run-time of the AutoCounterInstaller and any other listed installers. 71:     // Removes the counters, then calls the base uninstall. 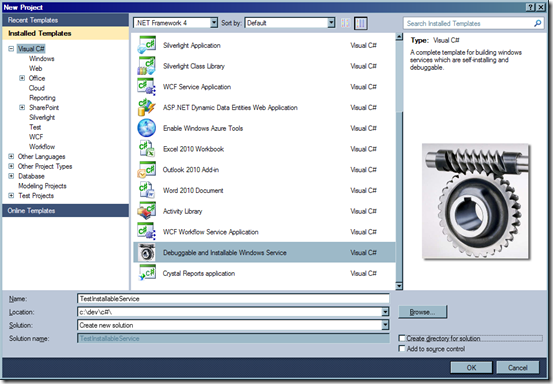 Construtor – queries the IWindowsService implementing type for the WindowsServiceAttribute and uses that as our configuration. 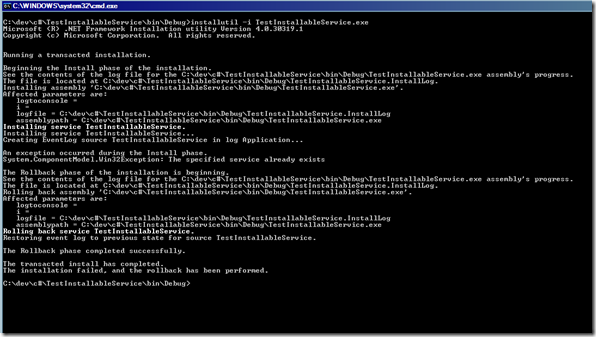 Install() – this virtual method is overridden from the Install class and is invoked by installutil for installation. 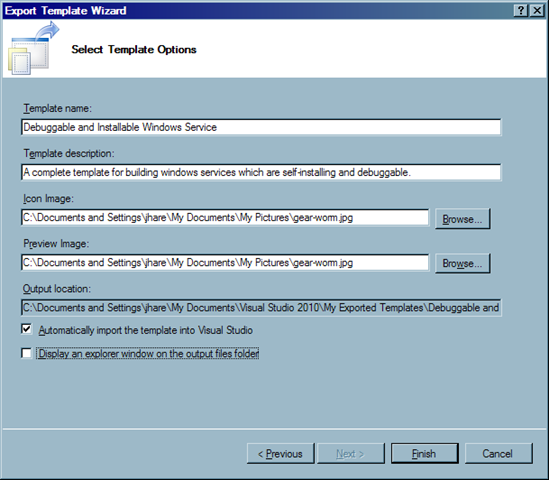 Uninstall() – this virtual method is overridden from the Install class and is invoked by installutil for uninstallation. RuntimeInstall() – this additional method is used to correctly invoke the Install() method at runtime (instead of installutil). RuntimeUnInstall() – this additional method is used to correctly invoke the Uninstall() method at runtime (instead of installutil). ConfigureXxx() – Windows Services need both a process and service installed, these configuration methods examine our WindowsServiceAttribute and create the correct sub-installers. 3:     // The main entry point for the windows service application. 6:         // if install was a command line flag, then run the installer at runtime. 12:         // if uninstall was a command line flag, run uninstaller at runtime. 18:         // otherwise, fire up the service as either console or windows service based on UserInteractive property. 23:             // if started from console, file explorer, etc, run as console app. The Contains() method is a nice LINQ extension method that allows you to check for the existence of an item in a collection, it is much better than the Contains() method in arrays because it allows you to specify a comparer, in this case we can use StringComparer.InvariantCultureIgnoreCase so that we do a string-insensitive compare so that variations like –UNINSTALL, –UnInstall, etc all work. Now, we’ve got all our code, so we should make sure that everything compiles well and then change our namespace to use the $safeprojectname$ template parameter. Helpful Hint: because template parameters do not compile, I like to use a simple namespace in my templates as I’m working on them (for instance, DebuggableInstallableService) and then use menu option Edit –> Find and Replace –> Replace in Files… to replace all instances of that temporary namespace to $safeprojectname$ before exporting the template. Make sure you fill in the details that you would like to see for the service name, description, and appropriate pictures (for the pretty factor). 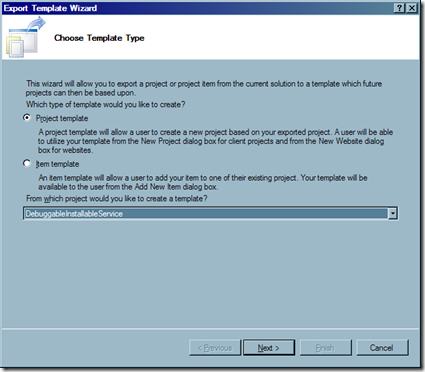 Make sure the Automatically import the template into Visual Studio checkbox is selected (so you can use it right away). You can also select Display an explorer window on the output files folder checkbox if you wish to copy or email the template file to friends and co-workers so they can import it (by double-clicking on it) as well. Once you fill in everything, press [Finish] to generate and import the template. 8:     // This method is called when the service gets a request to start. 14:     // This method is called when the service gets a request to stop. It’s there and ready to run as a service! But I promised you the service was self-installing as well and I wasn’t lying. Why do we care? Because installutil is often not in the path of your production machines and so it’s just a lot easier to have the option to have the service install itself. And once again you should see it go through the install steps and you should verify the service exists in the services menu. 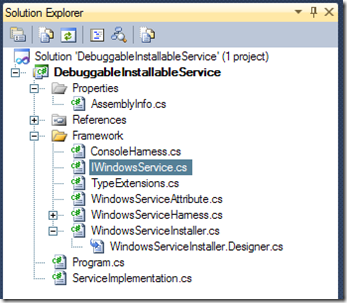 Windows Services can be great tools for long-running processes that handle asynchronous requests from queues or sockets, unfortunately the default Windows Service template does not make it easy to debug or install the services. Hopefully, by following these code examples, I’ve shown you some hints that can make your own Windows Services more robust and create a new Windows Service template of your own so you don’t have to repeat the steps every time.